If you are looking for a durable and reliable pickup truck with heavy-duty status, then among the other contenders you should certainly consider heavy-duty duo branded as GMC Sierra HD. These models available as Sierra 2500HD and larger Sierra 3500HD come with comfortable nature, considerable capabilities and good ride quality. Like its main rivals from the Ford and Ram, these models can be configured in variety of body styles, equipment levels and powertains and Sierra 3500HD is also available with dual-rear-wheel axle which raises its hauling capabilities. In terms of mechanics, these models share hardware with equivalents form Silverado HD series. The current generation of Sierra HD debuted in 2007 model year. Important upgrades were introduced in 2011 including new frame, suspension, upgraded turbodiesel engine and deluxe Denali trim. Next years have also brought some incremental upgrades in all aspects while the last model year added upgraded infotainment system, trailering package, and electronic steering system on higher end models. As for 2017 GMC Sierra HD, the models will add functional hood scoop which was shown on the Sierra Denali 2500HD but the same is expected with the 3500HD models. Other changes haven’t been announced and carry-over scenario is expected. When it comes to powertrains of the 2017 GMC Sierra HD, it looks that changes will be limited on the new air intake system which will provide fresh air for Duramax diesel engine. Details about this system haven’t been reveled and what exact impact it would have on engine’s performance. The same air-supplying system will be used on Silverado HD models with diesel engine and some sources claim that this system won’t bring better power and torque figures yet it will provide full-capacity work in broader conditions range and will prevent engine from being heated. System uses air/moisture separator which will provide air to be dry and it will also be at ambient temp which should improve combustion. New air intake system will provide up to 60 percent of dry and cool air for diesel engine. Aside from this, other changes haven’t been announced and therefore these heavy-duty models should be available with two engine options. The standard engine will be a 6.0 liter V-8 which currently produces 360 hp at 5, 400 rpm and torque of 380 pound-feet at 4, 200 rpm. This engine can only be paired with a six-speed automatic transmission. There is also CNG-powered version of this engine but with cost for power output of 301 hp. Certainly better option is a 6.6 liter Duramax turbodiesel V-8 which currently without of air-intake system produces 397 hp at 3, 000 rpm and 765 pound-feet of torque at 1, 600 rpm. It is coupled with a beefier Alison six-speed auto transmission. All models are available with standard two-wheel drive and four-wheel drive is optional. The 3500 HD models are available with either single-rear-wheel or dual-rear wheel setup. When it comes to the look of the Sierra models, these trucks are certainly among best-looking models. They look attractive and modern and considering some styling updates for the last model year they will likely continue unchanged in this aspect. Of course models with Duramax engine will get scooped hood which should be the only new moment for the upcoming model year. The models will also be available with recognizable grilles and with projector beam headlight and LED running lights. Different trims will also bring unique inserts and different level of chrome cladding and details. Side body sculpting will remain untouched and the same is with tailgate area. Interior side of the 2017 GMC Sierra HD won’t go with big changes either. The models are available in different levels of equipment ranging from base work trucks to luxury furnished Denali models. Interiors of these truck are well-designed and attractive with easy to use and recognize controls. Available bucket seats are comfortable and can be had with heating and cooling functionality. The infotainment system has been upgraded for the last model year and it supports Apple Car Play and Android Auto capability. The center screen is nicely fitted in the center stack and it is available with 8-inch premium version. 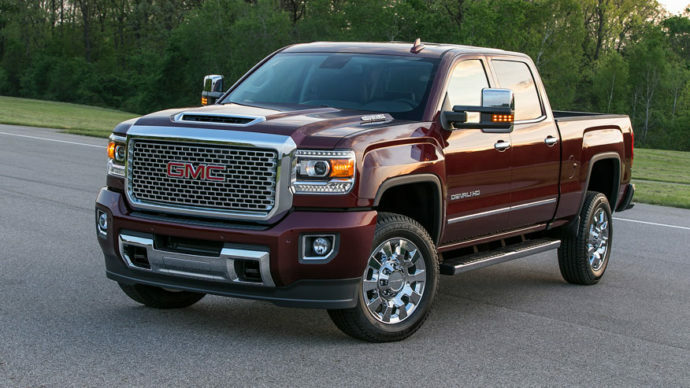 The GMC Sierra HD models will be available in variety of configuration options. They will come in three cab styles including regular cab, extended cab and crew cab models. Regular cabs will be only be available with longer 8 feet bed while crew cabs are standard with shorter 6.5 feet beds or optionally with longer bed. Available trims should include so far used options including base Work Truck, SL, SLT and top and the most luxurious Denali. Among trims some equipment regrouping is possible but big changes aren’t expected. There will also be off-road package which will include features like all-terrain tires, underbody protection, special tuned suspension, unique exterior details and so on. Among trims, the models will be available with 17-, 18- and 20-inch wheels. There will also be vinyl, cloth and leather upholstery. Model can also be had with dual-zone climate control, full power accessories, heated seats, eight-way power adjustable front seats, driver memory setting, power-adjustable pedals, etc. An InteliLink infotainment system will be available with 8.4 inch screen, voice commands, Smartphone integration, HD radio, premium sound system and so on. It will also include OnStar system and will provide 4G WiFi hotspot. The safety equipment will include antilock disc brakes, stability and traction control, trailer sway control, hill start control, but also forward collision alert, lane departure warring, etc. The new 2017 GMC Sierra HD will be available this fall. Company hasn’t said anything about pricing but unless GMC is preparing big surprise prices should stay close to the present boundaries. The base model is now available from around $34k.